This one-pot, quick meal serves 4 people, and can be expanded to serve more. Use a stove-top pan with a lid. Taste the Chorizo Sausage to see how hot it is. 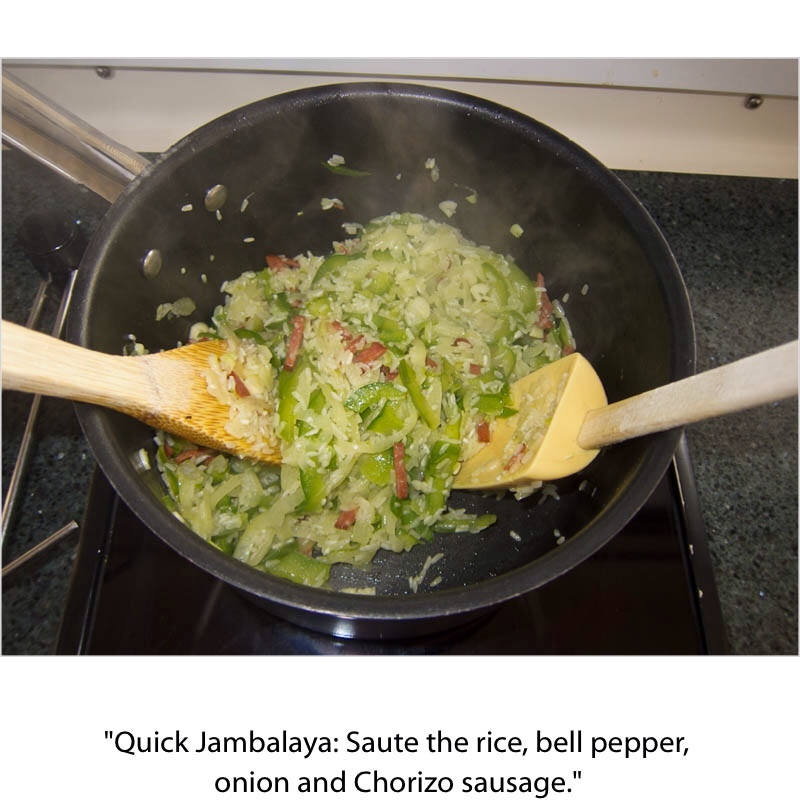 Use enough of the Sausage to flavor the Jambalaya, but not so much that the dish will be unpleasantly hot! The chicken is already cooked, and the Chorizo provides the spices. Heat the Oil in the pan, and add the Onion and Bell Pepper. Sauté over Medium heat for 5 minutes, stirring all of the time. Add the Garlic, Chorizo Sausage and the Rice. Continue to stir for a few more minutes to coat all ingredients with the Oil, and to heat the Rice. Add the Chicken Broth, 1/2 cup at a time, stir, and wait until the ingredients are simmering after each addition. Place the lid on the pot and simmer for 15 to 20 minutes, over Low heat, until the Rice is cooked. Turn off the heat and add the Smoked Chicken pieces. Stir well, remove from heat, and replace the lid, so that the Chicken will heat. You can pre-bake the Puff Pastry, if you wish, to ensure that the pastry is well cooked and puffy. Follow the instructions on the Puff Pastry package. 9-1/2-inch deep-dish (2 inches deep) or 10-inch regular pie plate. Roll out the pastry on a lightly floured surface into a 13-inch circle. Fit into a 9-1/2-inch deep-dish or 10-inch regular pie plate. Trim excess pastry, leaving a 1/2-inch overhang. Turn edge under itself and crimp decoratively. Put a rack in middle of oven. Preheat oven to 220C. Whisk together Eggs, Milk and Salt, and stir in the Salmon and Sun-dried Tomatoes. Turn oven down to 200C and bake for another 15 to 20 minutes, until the center is set (It should not jiggle when shaken). Transfer pan to a rack to cool to warm or room temperature. A one-dish meal that is quick to prepare, and perfect for the summer when fresh corn is in season. I have not tried the recipe with frozen corn, but it might be just great. In a wok or large skillet, heat the 3 Tb flavored oil from the jar of sun-dried tomatoes. Add the Corn, Sun-dried Tomato strips and Garlic. Stir-fry over High heat, for about 2 minutes, until the Corn is covered with oil and is heated. Turn down heat to Medium and add the Salmon. Toss until the Salmon is heated, but do not overcook, about 2 minutes. Serve in large, shallow bowls with fresh Basil leaves generously scattered on top. 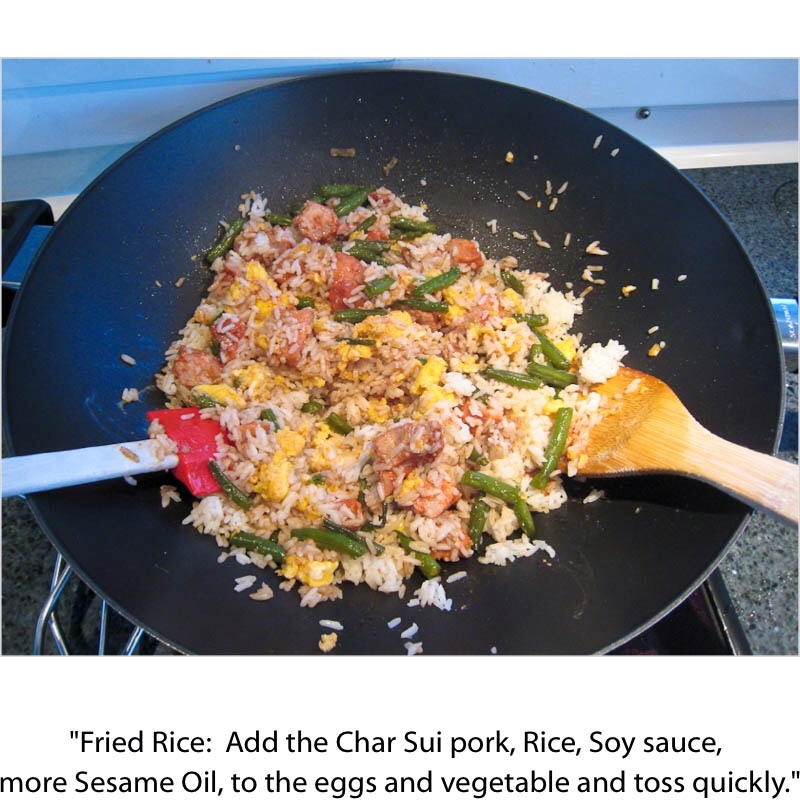 The inspiration for this recipe was an article in a 2010 issue of The Australian newspaper supplement. I have modified it to our tastes aboard ADAGIO. It is important to prepare all ingredients in advance, because you must assemble this dish very quickly in your Wok, and then whisk it to your guests who are already seated at the dining table. Char Siu is Chinese Roast Red Pork. You can buy it at a Chinese market, or make it yourself using the seasoning mix sold by http://www.globofoods.com. I can buy it online at Asianfood Supplies in New Plymouth, New Zealand, (sammi_7524@hotmail.com) and have also bought it in California at an Asian grocery. The brand is “Lobo – Roast Red Pork Seasoning Mix”, and comes in a bright red package. It appears to be fairly easy to find. This recipe serves 4, but can be cut in half to serve 2. Scaling the recipe for more than 4 people would not be possible in my Wok. Cooked Rice made from 1/2 cup Long Grain and 1/2 cup Jasmine Rice, cooked in 2 cups of water, within an hour of serving the meal. 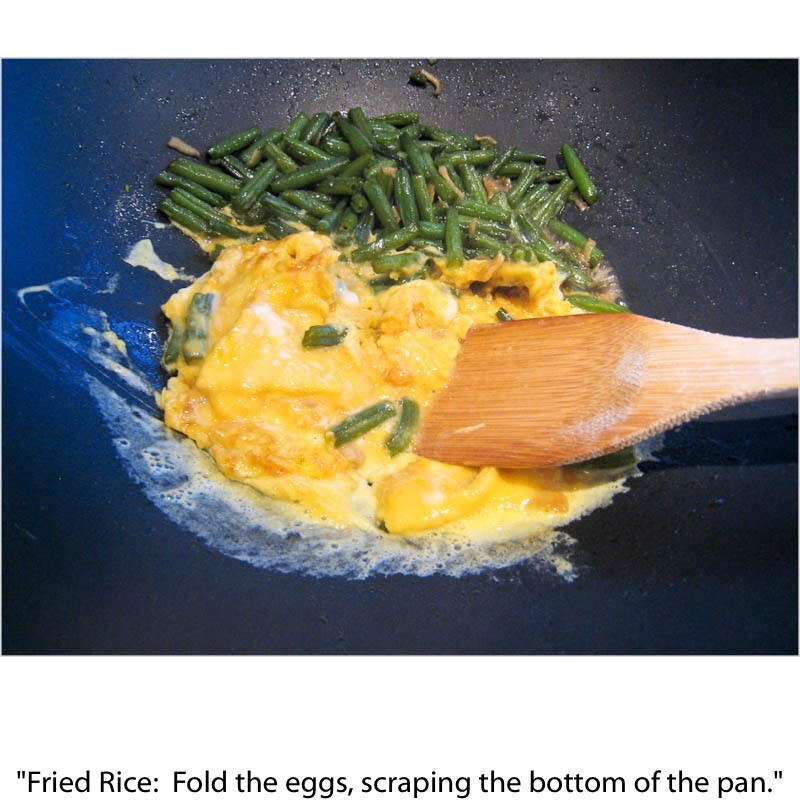 Breakup the rice if it has stuck together, before adding to the Wok, at the end of the instructions. 2 heads of Bok Choy, with the root base cut off, washed well, and sliced thinly across the stalk, including the leaves. Or Green Beans, washed, trimmed and cut into 2 inch-long pieces. 20 grams fresh Ginger root, peeled, sliced thinly into rounds across the grain and then each round cut into slivers. Work quickly, and do not overcook ingredients. If you have to pause to measure an ingredient, move the Wok off of the burner to avoid burning. Pour in 2 Tb Sesame Oil. Add the Bok Choy and Ginger root and toss with two spatulas to heat and cover thoroughly in Oil. Continue to toss and cook, until the Bok Choy has wilted to about half its original volume. Pour 1/4 cup Rice Wine over the Bok Choy and cover the Wok with a lid. Turn the heat down to Medium-Low and steam the Bok Choy for 1 to 2 minutes. Remove the lid and push the Bok Choy away from you, to the far side of the pan. Add the Eggs to the side of the pan closest to you. Let the Eggs set for about 20 seconds. Then slide a spatula under the Eggs to loosen them from the bottom of the pan, and slowly stir and chop with a spatula until they are still soft cooked. Add the Char Siu and quickly toss all ingredients together. Sprinkle on 2 Tb Soy Sauce. 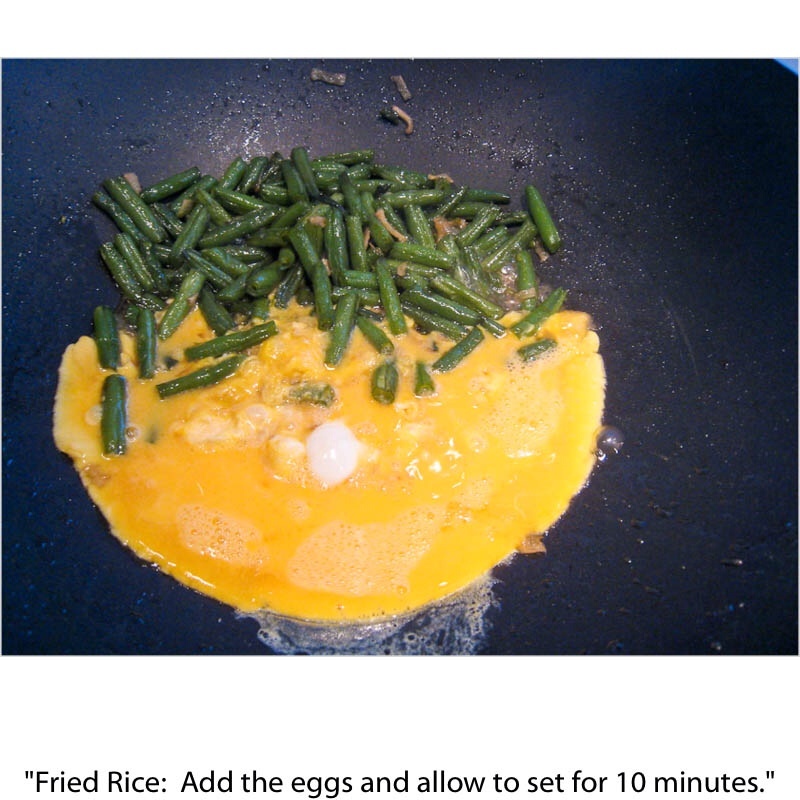 Add the Rice and 1 Tb Sesame Oil, and toss thoroughly, scraping the bottom of the Wok and separating the blobs of rice. Remove Wok from the stove. 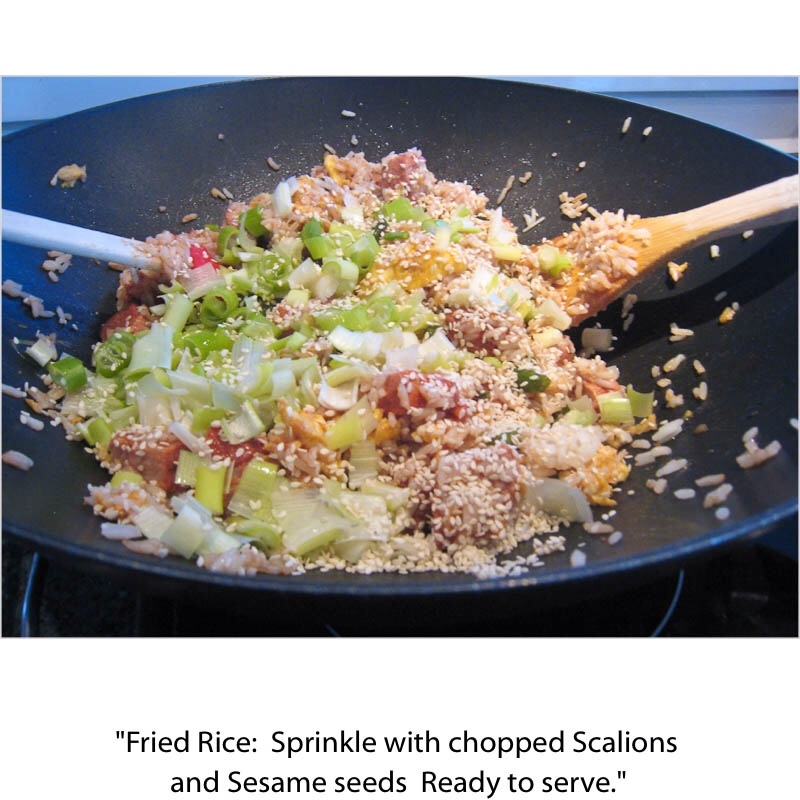 Sprinkle the Spring Onions and Sesame Seeds on top. Serve directly from the Wok, with a bottle of Soy Sauce on the table for salt-lovers. Hot Smoked Salmon was one of our great discoveries in Hobart, Tasmania. I always keep one or two packets in my freezer for a quick meal. By the time you have pre-heated the oven, the quiche will be ready to bake. Puff Pastry is a fun shortcut for a quiche crust. Filo Pastry can also be used in this recipe. Pre-heat oven to 220 C (425 F). Cut the Puff Pastry and fit into the pan with 1/2 to 1 inch to spare around the edges. If using Filo Pastry, just fit the four sheets into the pan, turning each sheet to avoid overlapping corners. Trim off excess pastry if you wish. Or turn the extra pastry edge under itself and crimp decoratively. I like to leave extra crust around the quiche. It becomes crisp and flamboyant in the oven. Whisk together eggs, milk and salt. Break the salmon into medium-sized pieces and add to the mixture. Add sun-dried tomatoes. Pour filling into the pie shell and bake for 25 minutes. Turn the oven down to 200 C (400 F) and bake for another 15 to 20 minutes, until the center is set, and a knife comes out clean. Transfer the quiche to a rack to cool to warm or room temperature before serving.